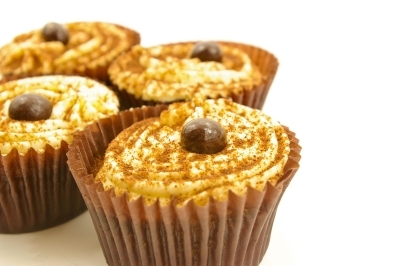 A good friend of mine always made these quick and easy Coffee Cupcakes. They are really delicious and can be served plain or fresh from the oven with cream or custard. There are two definitions for coffee cake. Cakes can either be served with coffee or they can contain coffee. Cakes served with coffee are traditionally flavored with nuts, fruit or cinnamon and often have a streusel or syrup topping. The same definition applies to cupcakes. These cupcakes are so quick to make and the apple helps to keep the little cakes delightfully moist. Coffee cupcakes make a wonderful dessert and they are really popular amongst my friends when topped with coffee buttercream frosting. These cupcakes are not difficult to make but they take longer to make than most other cakes as you need to boil several ingredients and allow the mixture to cool. I have tried rushing it and not waiting for it to cool completely, however, it does make the finished cupcake a bit denser. It is definitely worth waiting for the mixture to cool before adding the flour and egg. Combine brown sugar, chopped raisins, cinnamon, ground cloves, apple, butter, dissolved coffee in a saucepan. Stir over low heat until butter melts. Cool. Add lightly beaten egg and mix well. Add sifted flour and soda and mix well. Bake for 15 minutes or until a skewer inserted in the center of a coffee cupcake comes out clean.